Discussion in 'Retail Refillers Forum' started by savvy5321, Nov 10, 2010. I must say I was very impress with the response from this forum. I am in the planning stage of opening my inkjet and toner business and I constantly see very expensive refilling machines, Im looking at spending at least $16,000 just to get the starter packages that fee does include the inkjet and toner machine as well as a few supplies. I would rather save my money for a storefront. Do I need these very expensive machines to get started? Where did you get your refill equipment from? What equipment is a must have when refilling? What do you wish someone told you when you started your inkjet business? Im very new to the business, but I learn quickly so any helpful advice would be greatly appreciated. Looking at your CV above, and if you dont mind criticism here goes. Your planning must be at a very early stage to be asking does questions now. Have you looked into your intended market to see whats out there and who your main competitors are, also a shop front now that is ambitious? Keep it small, keep it tight, and know your intended customers, above all watch your cash flow. You are very correct, I have been researching this for about 3months now. I have no competitors in my area there are some about 60 miles to the north and south of me. And there are 3 walgreens store with refilling machine locally here but they do not work well an still can not fill 46% of the cart. that customers bring. I have looked into my customer base and there is plenty of small to med size business here. I'm focusing on private school, social clubs, Dr. offices, realtors and so on. I'm also in the process of completing my business plan and looking for mentors which is why i joined this forum. I also joined the local chamber of commerce to network with local business, I also started collecting cart. for refilling and lookin for more ways to gain cart. at the lowest price. For now my daugthers school has set up a cart. drop off ben for me that I can have free of charge. So I am working hard, just want to see how the pro's do it. I hope it all goes well for you in the future.. The reason Walgreens can't fill a lot of cartridges that come in is because those are usually cartridges with anti refill chips or a refill unfriendly design. I think Walgreens is not your biggest competitor since they only refill a niche of mostly HP cartridges. No your biggest competitor is going to be generic cartridges with chips sold online. If you look at the prices of those cartridges you're going to have to beat those prices in order to really entice people to get your refills. This makes margins razor thin as it is considering the price of those limited capability refill machines. You also have to consider you're going to need to reset chips in order to guarantee success. I know a couple low volume refillers that simply fill cartridges but people run them dry and damage the cartridge or worse their print heads for printers with individual ink tanks and they come back looking for blood. Or that next time they come back and get another refill they get mad when it fails and then you need to give them a new working cartridge, you eventually then have to stock up on a supply of generics as a customer satisfaction backup to give away when a refill fails. Remember these are cheapskates that squeeze every penny til Lincoln says "Ouch! Quit it!" So they'll run their cartridges dry without ink monitoring just so they get every last drop of precious ink. So the business plan ends up being that you can't refill printers with individual cartridges that you can't reset. It's important for liability reasons not to ruin other people's printers. What I've found would probably be best is if you set up a two tier trade in program where you can buy generics at full price or basically sell generic cartridges at a discount for trading in empties. 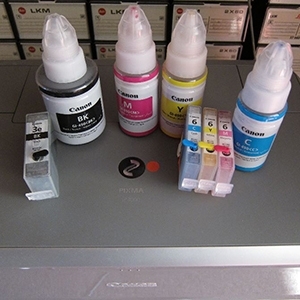 The empties that are refillable get refilled, relabled (and if you can build up a supply of test printers you can test them) sold in the same way with the guarantee that if it doesn't work you get to take it back for a replacement. This makes it easy to do a higher volume business and saves time by filling cartridges during off times and not on demand. It also guarantees more success stories and not an ever dwindling stock of back up cartridges for customer satisfaction and an ever growing dis-satisfied customer base. Basically it's going to be a big investment in either money for the fancy refill machines or careful planning of your business model and refill/reset technique to ensure customer satisfaction. If you're willing to work on it that much hats off to you. You could even make a whole store dedicated to all sorts of printing. Get a CISS on a good Epson and do photo prints and elargements, get a good scanner and do photo reprints, print on photo cd's for people or partner up with the school photographer to print out photo cd's if they don't currently do it. You can even do t-shirt transfers pretty cheaply with a hand iron in the back, don't show them how to iron on the transfer though, cause it's a business secret Basically diversify and make yourself look bigger than just some small refill shack and you'll look better which is better for business. WOW! thanks very good info and great ideas on generating more business. I going to make a hefty investment very wisely. Im going to look into resting those chips. I did see some chip resetter out there but not to sure on which on is the best any recomendation? I have no experience with resetters. Because I refilled my Canon's and disabled ink monitoring which used to prevent excessive head cleanings I lived with just manually checking my printer's ink levels. You can't trust customers to do that, it's why they're coming to you in the first place. I think you should get a variety of resetters and there are a few reviews here for the more popular resetters so just search here for them. Hi, I too would like to thankyou for your ideas and information.